Just turn it up and down. It learns the temperatures that you like and creates a schedule for you. Don’t waste energy heating an empty home. 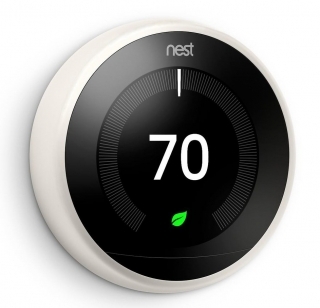 Nest automatically helps save energy when you’re out. Now you can control your hot water tank. And give your hot water a boost when you need it. Change the temperature and control your hot water tank from anywhere using your mobile, tablet or laptop. Will Nest work in my home? Nest Display, Base, Heat Link, Optional trim plate, Mounting screws, Installation guide and warranty, Welcome Guide, Nest Pro installation card.